Could City Employees Provide a Major Source of Enrollees for MetroPlus Gold? How Does Pay at NYC Transit Compare With Other Metropolitan Transportation Authority Agencies? How Much Has the City Spent on Overtime Over the Past 10 Years? Over the past 10 years, New York City’s overtime spending has increased from $928 million in 2006 to $1.659 billion in 2015, an increase of $731 million, or close to 80 percent (about 40 percent after accounting for inflation). 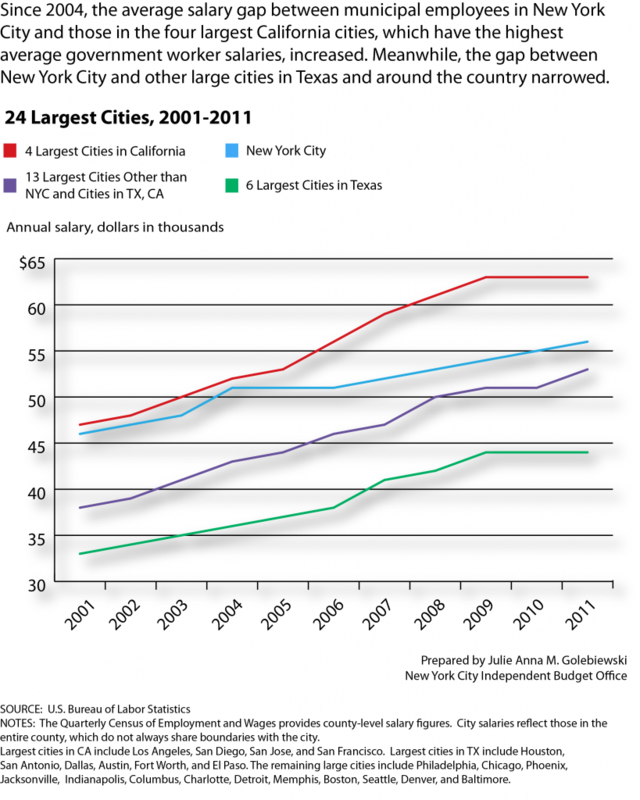 While the increase in overtime spending over the 10 years appears sizable in dollar terms, as a share of total city spending the increase looks somewhat more modest: growing from 1.7 percent in 2006 to 2.2 percent in 2015. Uniformed personnel including police, fire, correction, and sanitation accounted for roughly 70 percent of total citywide overtime spending, with the cost increasing from $635 million in 2006 to $1.190 billion in 2015, an increase of $555 million, or close to 90 percent (about 45 percent adjusted for inflation). The city’s civilian workers, roughly three-quarters of the municipal labor force, accounted for the remaining increase in overtime spending. For them, overtime spending grew from $293 million in 2006 to $469 million in 2015, an increase of $176 million. About half of that increase, $89 million, was for civilian workers in the police, fire, correction, and sanitation departments. The agency with the largest increase in overtime spending over the 10-year period was the police department. Overtime spending for uniformed and civilian staff in the police department grew from $412 million in 2006 to $716 million in 2015, an increase of $304 million, or 74 percent. Uniformed staff accounted for $252 million of the increase and civilian staff $52 million. Though the dollar amounts were less, the fire department also had a 74 percent increase in overtime spending during the 2006-2015 period. 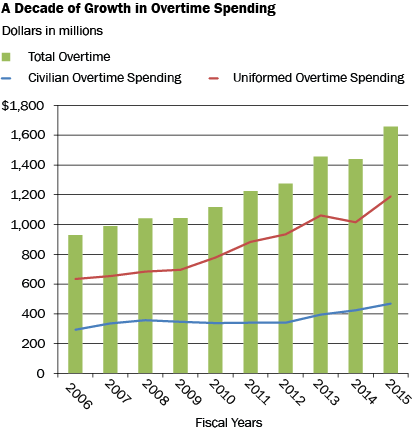 Overtime spending grew from $194 million in 2006 to $337 million in 2015, an increase of $143 million ($124 million for uniformed personnel and $19 million for civilians). At the Department of Correction overtime spending increased by 180 percent, rising from $70 million in 2006 to $196 million in 2015, an increase of $126 million ($116 million for uniformed staff and $10 million for civilians). Did the Number of Municipal Employees Decrease Under the Bloomberg Administration? When Mayor Bloomberg presented his last budget plan in November, he noted that the city’s full-time and full-time equivalent headcount had fallen by 15,368 since December 31, 2001. 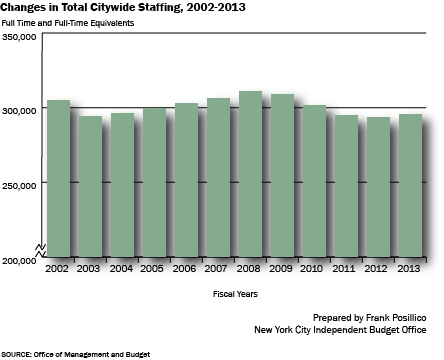 But looking at staffing levels since the end of fiscal year 2002, which marks the beginning of Mayor Bloomberg’s first full-year budget, the numbers are somewhat different. From June 30, 2002 through June 30, 2013, city staffing decreased by 9,028 positions and totaled 295,894 by the end of fiscal year 2013, a 3.0 percent decline. For many agencies, there was little change in staffing from June 30, 2002. Two areas of the budget accounted for the largest decrease in staffing, the education department and uniformed services. The largest decrease—4,607 positions—occurred in uniformed services, including 1,986 police officers (a decline of 5.4 percent), 1,141 fire fighters (10.1 percent) and 1,645 correction officers (15.5 percent). The education department saw a decrease of 4,496 positions (3.3 percent), of which 2,528 were teachers and professional staff.